With all of the amazing sunshine (hello, tees and shorts in April!) we’ve been getting lately, it’s been hard not to deck myself in head-to-toe colour to reflect the happy mood. We Vancouverites don’t often get so lucky in terms of weather during spring, so I am soaking up every single minute that I can – and that means outdoor runs and patio brunches aplenty. Another favourite thing to do on a sunny day in Vancouver is to visit Granville Island, and here’s a comfy, elevated casual look I wore to spend the afternoon there the other day! That jacket! So fantastic. Love the colours. Hurray for beautiful weather! Your outfit is lovely. Gorgeous jacket. 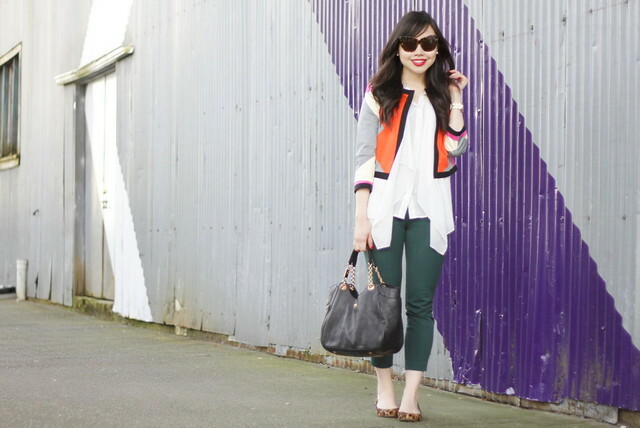 I want some cropped color pants for spring, love the color you are wearing. I just love those flats! Love the jacket with the flowy blouse!! You look super cute! That H&M white blouse is definitely a winner. I’m surprised it’s H&M. Looks so luxe. Makes me wish we had H&M here. Didn’t realize how spoiled I was to have it when I lived on the Mainland. 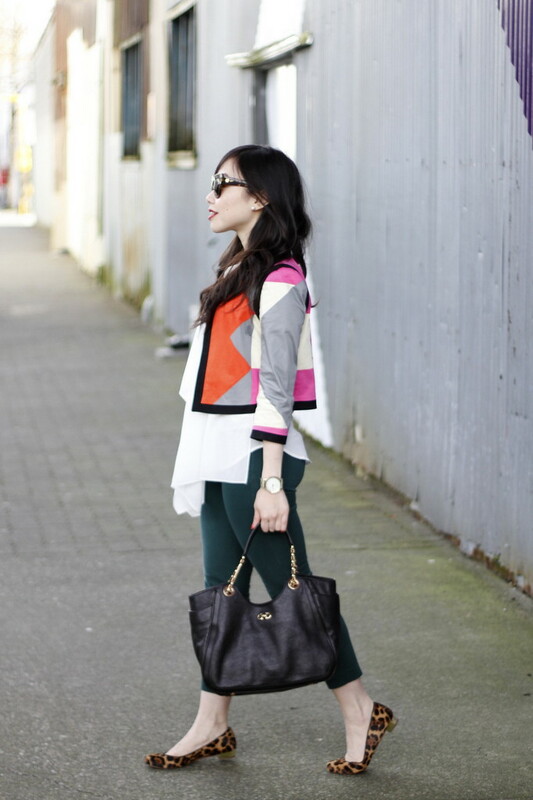 Loving your bright frame of mind and all the color you infuse into your wardrobe. Since looking at your outfit from yesterday, I guess I was subconsciously influenced into wearing minty-seafoam/pistachio green and blue today. And I don’t color block naturally, as you know. Thanks, again, for all the inspo. 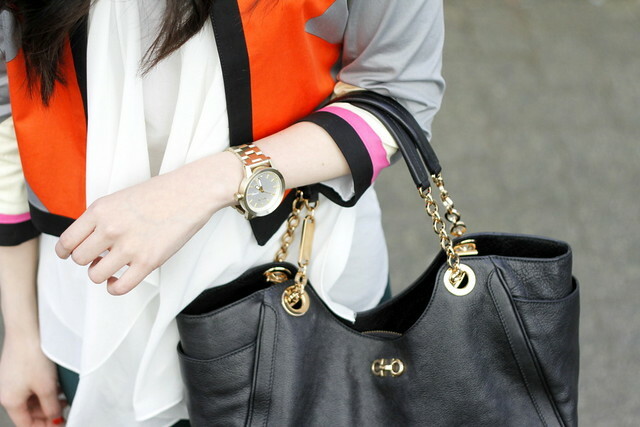 i really admire your blog! and your outfits! please visit mine if you have time at http://www.kristinjrn.com thanks you! I love Granville Island, so fun! The flowers there are wonderful too! 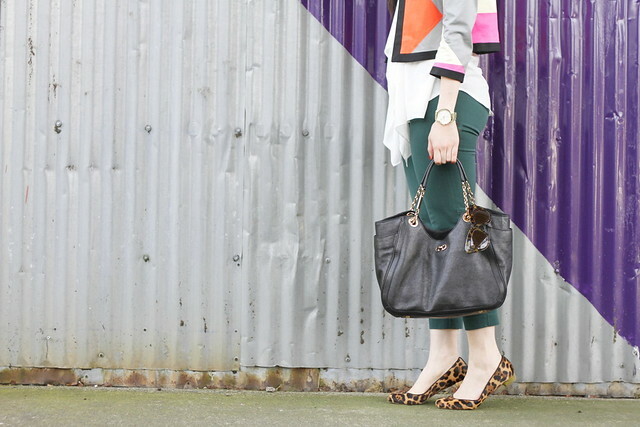 Those leopard flats are so cute! Did you score them on sale? Love the bright colours too! Love that jacket! Very pretty.